Get out and explore! For those of us here in the Pacific Northwest or planning to visit, we have found an excellent resource to help you do this. 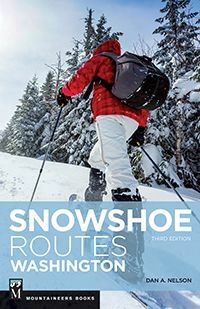 The most current edition (3rd Edition) of Snowshoe Routes: Washington is loaded with invaluable information to assist you in making the most of the winter weather in the Evergreen State. This book is very well organized, starting with an overview map of the state indicating the location of each of the 100 routes, followed by Routes at a Glance, a quick way to identify key bits of information like difficulty of the route, avalanche potential, best time to visit, and amount of time it takes to complete the route. Dive into the meat of the book, and you’ll find a location map, photo from the area, and plenty of good details on what to expect (e.g. elevation gain, high point, directions, parking, terrain, etc.). We visited the Gold Creek Pond Loop in Snoqualmie Pass and found the description/details to be spot on and appreciated the advice on snowshoeing counterclockwise around the pond for the best views. We’ll definitely check out more routes in this book before the end of the season!